They may have no love for Obamacare, but a new poll shows that more than half of Americans now think that it is the responsibility of the federal government to ensure that all Americans have health insurance overage. A new Gallup poll finds that more than half of Americans agreed with that sentiment, up six percentage points from 2014 and the first time since 2008 that a majority of Americans feel that way. The percentage of Americans who think government has a duty to ensure health care has increased over the past year in key demographic groups, including Baby Boomers and independent-leaning Democrats. The South is the only region in the country where sentiment has not shifted toward the view that health care should be the government’s responsibility. Among those who approve of the Affordable Care Act, eight in 10 Americans agree that it’s the government’s responsibility, while just over a quarter of those who disapprove of the law feel that way. 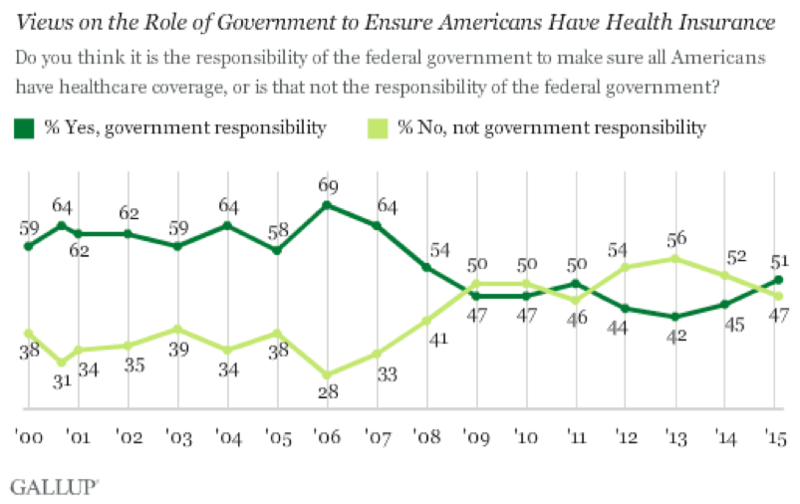 Even among those who think that health care is a government responsibility, more than half prefer a private insurance system, with senior citizens the most likely to feel that way. Support for a private system declines as Americans get younger, with 53 percent of those under 30 supporting a government-run system. Separate Gallup data release last week showed growing discontent with Obamacare and the U.S. health-care industry in general, although they continue to have a positive view of their personal health care.